New data collected by the Curiosity rover shows that Mars was once quite Earth-like, featuring river deltas, lakes, and a warm climate. What’s more, the Red Planet may have been able to sustain liquid water at the surface long enough for life to emerge and evolve. Late last month, NASA stunned the science world by announcing the likely presence of liquid water on Mars. The revelation was one in a series of discoveries highlighting the prominent role played by liquid water in the geologic history of the Red Planet, both in the past and today. The latest finding by NASA’s John Grotzinger and his team at the Mars Science Laboratory contributes significantly to this line of thinking. Evidence uncovered by the Curiosity rover shows that ancient Mars once featured river deltas, long-standing lakes, a climate much warmer than it is today, and it could sustain surface water for surprisingly long periods time—long enough for life to have potentially emerged and taken root. The new findings were published today in the journal Science. 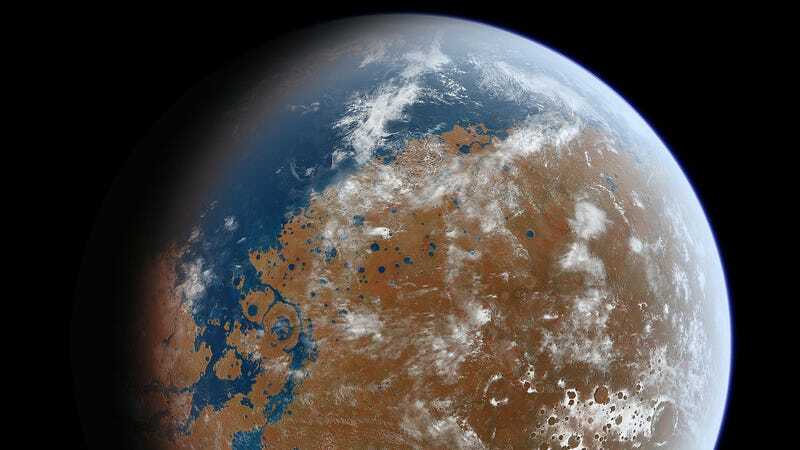 The notion that Mars was once able to sustain large bodies of liquid water at the surface is nothing new. What is new, however, is evidence supporting the idea that large impact craters were once capable of collecting and storing water for substantial periods of time. Unlike observations from space-based cameras, Grotzinger’s team was able to leverage the power of Curiosity’s on-site presence to discover basin surfaces, or clinoforms. With Curiosity right there, it’s like having an actual geologist on the Martian surface. Curiosity has been romping around the Gale Crater looking for clues left behind in the sedimentary rocks. These tightly packed layers of rock, which formed from the steady accumulations of tiny sediment grains, provide an historical snapshot of the surface. And as we know from studying sedimentary rocks on Earth, these rocks often include evidence of life, such as fossils and microscopic biosignatures. The researchers analyzed sediments along the clinoforms, observing that—in spite of erosion—the basin surface had risen over time. This indicated to the researchers that the land had gotten higher, likely due to the steady accumulation of sediment deposits, a process known to geologists as aggradation. As Gale Crater’s northern crater wall and rim gradually eroded, gravel and sand were transported southward in shallow streams. Over the course of time, these stream deposits moved progressively closer toward the crater’s interior, where it transformed into finer grains downstream. In other words, the researchers discovered traces of ancient river deltas. These deltas represented the boundary of an ancient Martian lake where fine, mud-sized sediments had once accumulated. Evidence suggests that these individual lakes, which existed billions of years ago, were stable for 100 to 10,000 years at a time— long enough to spark and sustain life (though astrobiologists aren’t entirely sure of this). Evidence for extraterrestrial life has yet to be discovered on Mars, but this latest finding shows that key ingredients were once available for microbial life to originate and evolve. The area being studied by Curiosity required at least 10,000 to 10,000,000 years to accumulate, which means these transient lakes were likely fueled by a common groundwater table. “This intracrater lake system probably existed intermittently for thousands to millions of years, implying a relatively wet climate that supplied moisture to the crater rim and transported sediment via streams into the lake basin,” write the researchers in their study. To age these transient water bodies, the researchers compared physically similar depositional systems on Earth, for which we have radiometric chronologies. Given that Mars was once able to sustain water for extended periods, it’s reasonable to wonder about the Red Planet’s ancient climate. Unfortunately, it’s difficult to say. Chan says that Mars could only likely sustain that climate if the atmosphere was thicker back then. “We can tell that these bodies of water had to last for a while because of how the sediment grains are sorted and laid down in multiple layers showing that the environmental conditions allowed sediment accumulation (thickness) over time,” she told Gizmodo. Fischer says that all our current understandings of Martian climate can’t explain why early Mars was so warm and wet, but the geology has just become much more compelling. Fischer likens the problem to the early days of understanding continental drift. Geologists knew that continents were slowly moving, but they didn’t understand why. Read the entire study at Science: “Deposition, exhumation, and paleoclimate of an ancient lake deposit, Gale crater, Mars”.